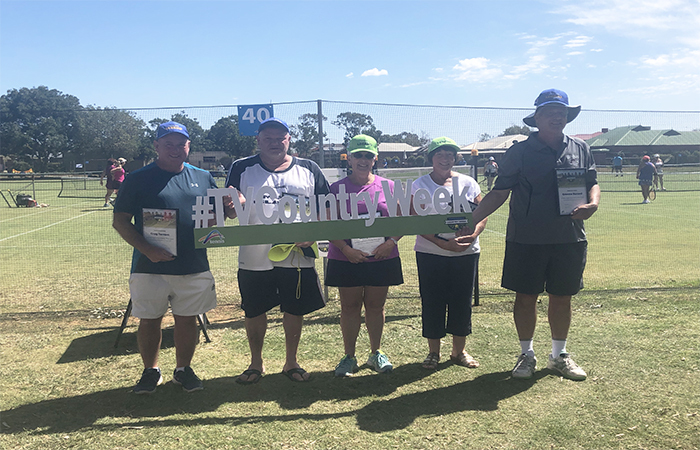 The 2019 Tennis Victoria Country Week event has begun with the awarding of five new Country Week Legends. Chris Rye, Jenny Reid, Graeme Barned, Greg Tarrant and Yvonne Child were announced as the newest Country Week Legends, adding to the six inaugural Legends from last year. 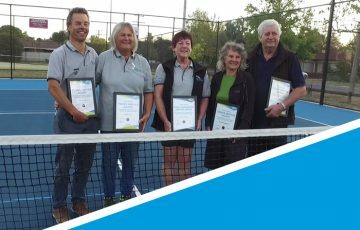 They join Brenda Bishop, Dawn Whykes, Norma Sim, Robyn Darby, Pat Flynn and Trevor Holt who were awarded Legend status at Swan Hill in 2018. 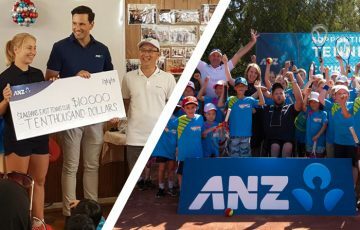 The presentation was conducted during Day One of play, with Tennis Victoria President Dr. Emma Sherry and Greater Shepparton Councillor Dennis Patterson on hand to assist. Dr. Sherry was full of praise at the wonderful contribution these participants have had on the historic event. “I would like to first congratulate Chris, Jenny, Graeme, Greg and Yvonne for everything they have done, not just for themselves and their teams, but for the event as a whole,” Dr. Sherry said. “It’s people like this that make this the greatest community sporting event in the world. “I always look forward to Country Week and think it’s the perfect way to complement the Summer of Tennis,” she said. Chris started his Country Week journey playing at the Junction Oval, however, his first regional event was 1996 in Swan Hill. 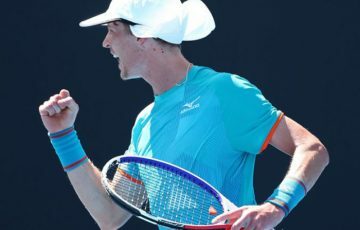 He hasn’t missed a Country Week since, despite snapping his Achilles on day one of competition in Wodonga. Organising the Mud Island team, he has seen it grow from two teams to seven. He is nicknamed the ‘Raging Bull’ for his ferocious serve and volley game. Jenny has ventured to Country Week for almost three decades, missing only one during that time. Her dedication is exemplified by her many years of service to the Tongala team. She has also introduced people to the event and enjoys the friendships made along the way. A passionate Albury Crocs team member, Graeme Barned has made Country Week a permanent fixture on his summer calendar. He enjoys the banter the event brings and makes a point of catching up with as many Country Week participants as possible. Greg Tarrant has played since the 1991 event. He has won many grade premierships and considers Country Week an incredible event to be a part of. Now a Kyabram local, it doesn’t matter where the event is held you can always count on him to be present. Playing more than 25 years consecutively, Greg truly embodies what Country Week is about. Yvonne has is celebrating her 30th Country Week event. A splendid achievement matched only by her immeasurable efforts to ensure her team has been taken care of. She’s also encouraged others to take part in the event because of the considerable amount of fun she’s had over the years.